Recently after an emotionally taxing day my husband Robert wanted a childhood favorite – tomato soup with cheddar cheese and toast. It’s sort of an unconstructed version of grilled cheese and soup that his mother made him and is a dish he described as a ‘comfort food’. It holds no comfort for me however, which got me thinking about this notion of comfort foods. We all know they exist but what are they anyway? When we were writing our cookbook “The Cooks Book of Intense Flavors” a couple of years ago we included a whole section of “Comfort Combinations”. It was a chapter that wasn’t included in the final cut for the book (along with 200 other recipes, but don’t get me started). I found that the recipes that landed in this chapter were often not fancy, in contrast to many of the others, and that they were often soft in texture, like mashed potatoes or cake. They were the kinds of food that everyone from toddlers to the elderly would like. But no flavor profile can hold these comfort foods together because they are based on a sense of sentimentality, and we all have a different history. The texture isn’t the key for the comfort foods, the aspect of familiarity is. Gorging myself on these cinnamon rolls provided more than a full belly, I was left with a dose of nostalgia. Not only did they taste yummy then, but I could increase the pleasure of eating them by remembering how good they tasted in the past too. I remembered people in my life during that time in high school who I have drifted apart from and wondered how they were doing. The food both soothed me now and took me back to a different day. In life the unexpected often happens and the unplanned shows up at your door demanding a response. Is it so wrong to take refuge in the familiar, even if that is a bowl of macaroni and cheese? Reading your article filled me with childhood memories of “snow days!” My mother taught school so snow days were especially nice since my sister and I got to share them with Mom. 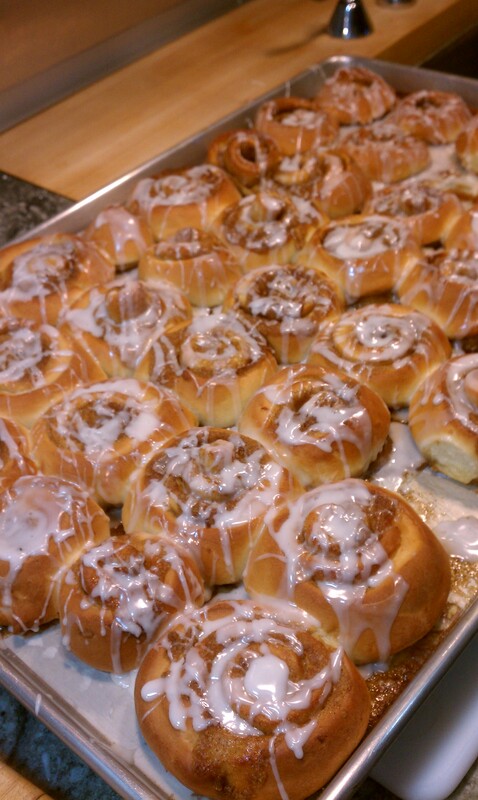 And, they almost always included the baking of cinnamon rolls–a pan of sticky buns and one of cinnamon with icing–YUM! The mixing them up and rolling them out together; the expectation as we waited for the dough and then the rolls themselves to rise. The incredible smell of the baking bread; the waiting for them to cool enough to eat only made the experience of tasting that much more fulfilling. Warm cinnamon rolls with a glass of milk–it doesn’t get much better than that! Thanks for the memory spark, Molly!